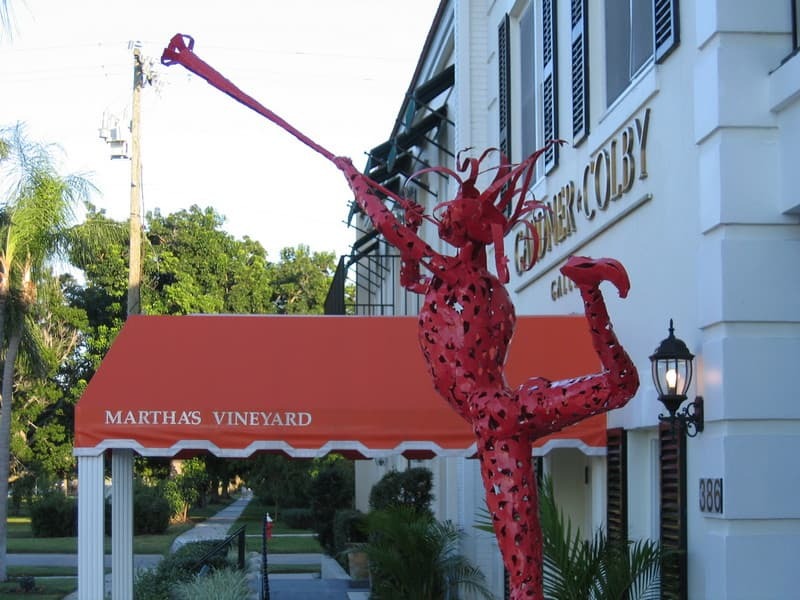 I lived in Naples Florida for several years, and could dedicate an entire website to nothing but the town and its delights. Maybe I will at some time in the future. The focus of present day life in Naples are the two historic business districts: Fifth Avenue South and Third Street. 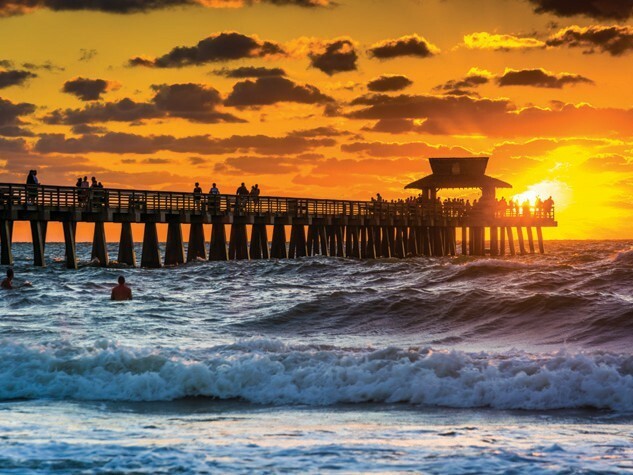 The Naples Pier is in the Third Street District. 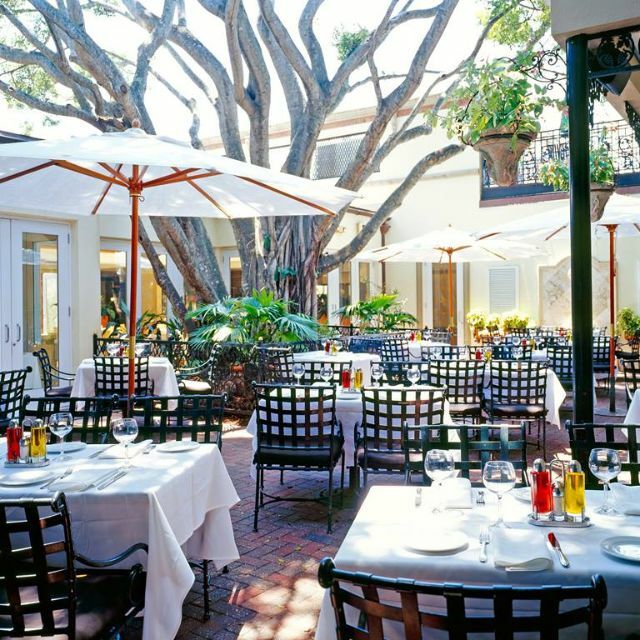 Great restaurants and shops abound in both districts, which are in the heart of what is known as Old Naples. Downtown Naples and Old Naples feature many art shows and classic car shows in the season. Cambier Park is a local treasure in the heart of the city that has free movies every Saturday evening in season, and free band concerts every Sunday afternoon. 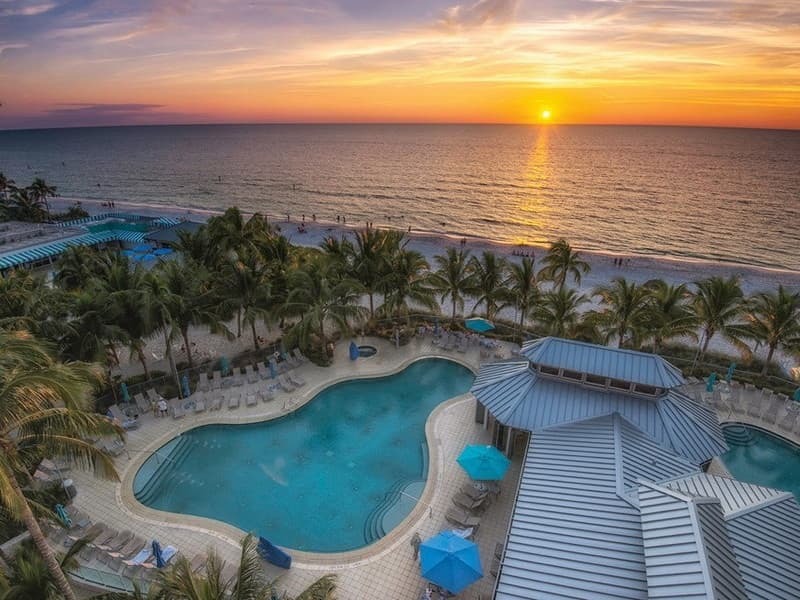 Free concerts are also held in the summers at the Naples Beach Hotel and Golf Club. Downtown Naples also features the Sugden Theater, a community showcase for live plays, and the Norris Center, a smaller venue at Cambier Park for plays and small musical events. Von Liebig Art Center is on the northwest corner of Cambier Park. It features wonderful art exhibits all year long. 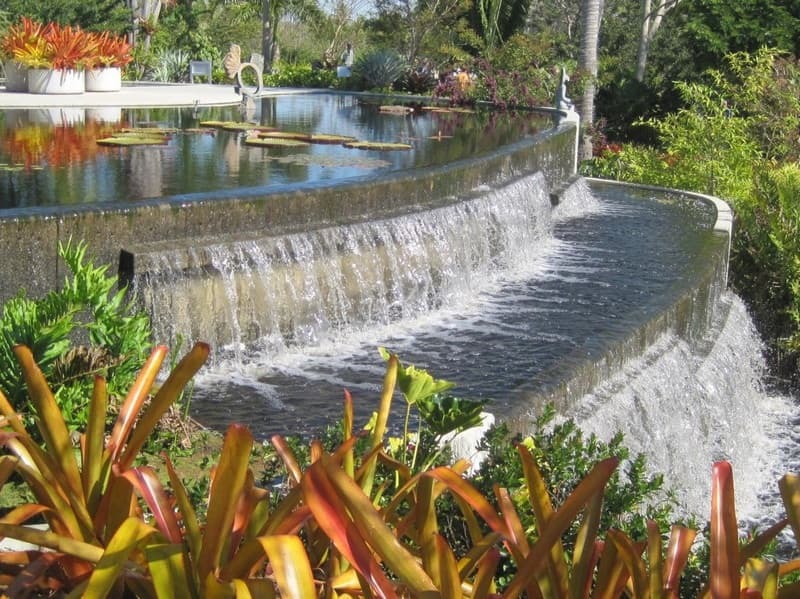 The fountain and waterfall above is at the Naples Botanical Garden. The Pelican Bay development just north of town features the Philharmonic Center For The Arts completed in 1989 at a cost of almost $20 million. The "Phil", as locals call it, has a full program of music, dance and theater. Many traveling art exhibits also stop at the adjacent art museum. Nature lovers will enjoy visiting the Everglades, whose nearest entrance is at Everglades City. You can explore the Everglades on foot or by canoe or airboat. You can even ride in a swamp buggy. Guided tours in these uniquely Naples machines are offered by Everglades Island Airboat Tours. The Naples Zoo at Caribbean Gardens is also a favorite Naples attraction. The Naples area also has dozens of parks and wildlife preserves, and a world class botanical garden. The town has done a great job of preserving its historic residences and commercial buildings. Check out Palm Cottage, maybe the oldest building in Naples. 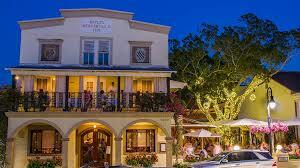 A few years ago I lived in Naples, Florida, and was fortunate to be able to eat out almost every night. For people who love dining and drinking, Naples is a virtual paradise. Among the multitude of wonderful places I tried, one stood out in my mind as the most wonderful: Campiello Ristorante & Bar in the Third Street Historic District. I usually dined alone in those days and ate at the bar. You can sit inside or outside depending on your inclination or the weather. An advantage of dining alone is that you don't have to wait on a table. 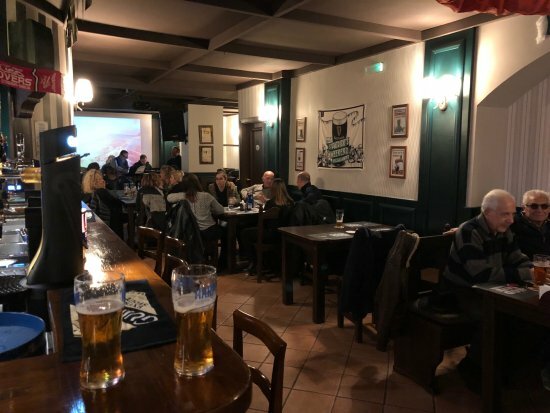 There is often an empty seat at the bar. A favorite bar meal for me was their wood-fire pizza. I especially liked the Molinari Sopressata with fresh Mozzarella and fresh Oregano. That thin crispy delight, added to their Campiello House Salad, kept me happy for hours. If the weather is right, you can enjoy eating in their courtyard, watching people walk by who wish they were in there eating too. The menu is crowded with all of your favorite Italian favorites, starting with Antipasti featuring at least 9 great combinations. All of their pasta is made in house and they have it all from Spaghette Alla Chitarra to Linguine Fini with clams, whole chili, white wine, and garlic. Their main entrees are prepared on a wood fire rotisserie and grill. These include spit roasted chicken, grilled organic Scottish Salmon, bone in New York Strip Steak, grilled cobia, grilled veal chop, and more. 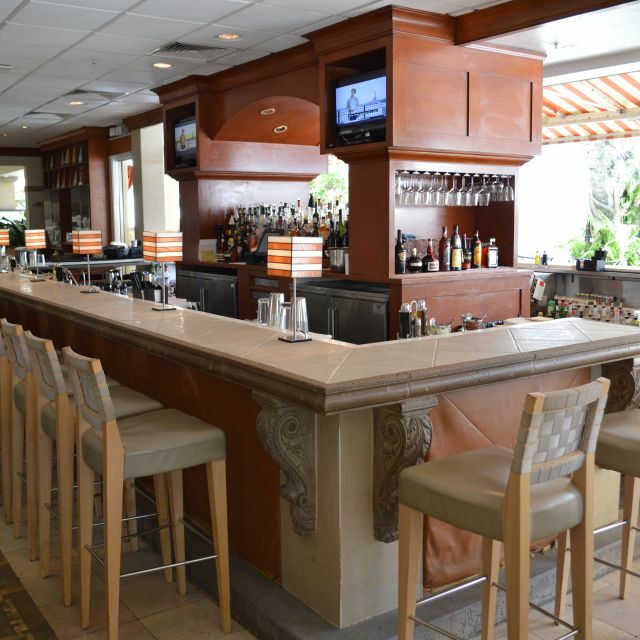 There specialties include pan roasted black grouper, balsamic glazed short ribs, and sauteed snapper picatta. Campiello has an extensive wine selection ranging from affordable to second mortgage territory. They also have a full service bar. This great place is open 7 days a week. Lunch is 1130am to 300pm. Dinner is 500pm to 1000pm Sunday through Thursday, and 500pm to 1100pm on Friday and Saturday. Between 300pm and 500pm you can chose from a limited bar menu. 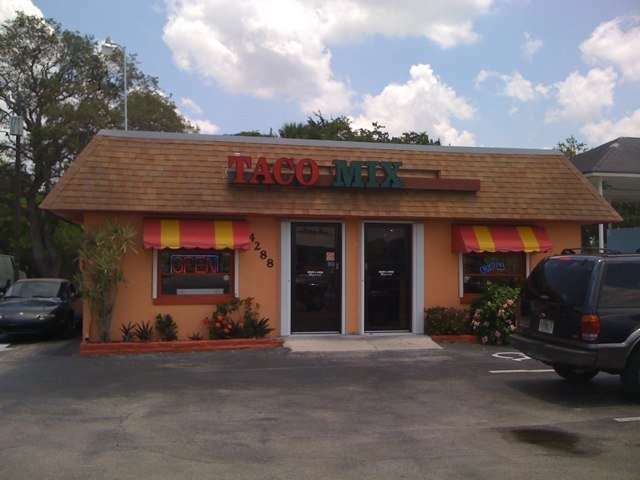 Taco Mix is a place you might never stop at if you didn't have local information. It was not even mentioned on TripAdvisor when I first visited it a few years ago, but I checked it out on Urban Spoon. It is on the right hand side of Bonita Beach Boulevard west of Tamiami Trail on the way to the beach. The restaurant itself is almost hidden behind a convenience store of the same name. The restaurant is small and clean, and even has a drive through window that locals are well aware of but that a tourist might completely miss. Once inside you will see a counter where you place your order from a menu on the wall above. You place your order, then sit at one of the tables or booths in the bright and open dining room to your right. A waiter or cook or owner (or all three) will bring your order to your table. I have loved tacos since they were first introduced to me by my sister-in-law Wendy in 1973. Since then, I can't get enough of them. Taco Mix has the best tacos I've ever eaten, and I've eaten a lot of them. In my opinion, their offerings beat the big chains all to heck. Hard shell or soft shell ground beef tacos cost $ 0.85 each. They also have soft shell chicken tacos for $ 2.00 each. They have steak burritos, quesadillas, Cuban sandwiches and more. You can't go wrong. The owner and his family are Cuban, so there are plenty of dishes from that Caribbean country. One of my favorites is picadillo, a specially spiced ground beef served with rice and plantains. This small restaurant is a place where you can feed three adults and two kids for about $20. I know it can be done because I did it. Prices are very reasonable, especially by Naples and Bonita Springs standards. There are enough locals that come in to keep prices and quality on a better level than most places that just cater to tourists. They have beer, but no hard liquor. If you like Tex-Mex and Cuban, you will love this place. Whole Foods Market is a great place to eat if you are in a town that is lucky enough to have one. 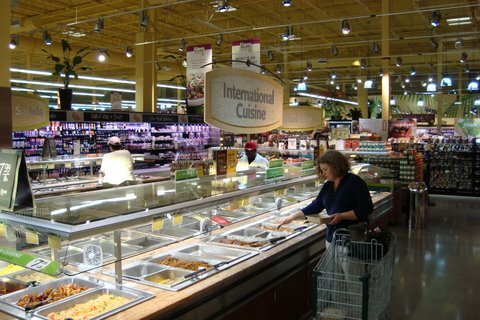 Although most people think of it as more of a grocery store, which it certainly is, it also has a great buffet and a separate dining area. They are more likely to think of it as a glorified grocery store full of natural and organic foods and frequented by rich liberals and pale emaciated looking vegans. They are more than half wrong. It is also frequented by poor fat people of all political persuasions as well as dedicated meat eaters. There is something for everybody to love. For years it has been my tradition to eat lunch out. I can't stand to stay home and eat lunch alone, and when I worked it was a good way to get out of the office and see and meet other people. 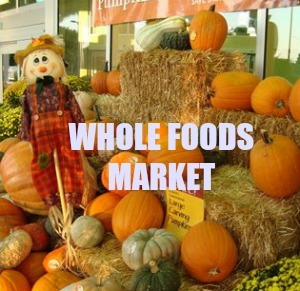 There are 16 Whole Foods Markets in Florida. 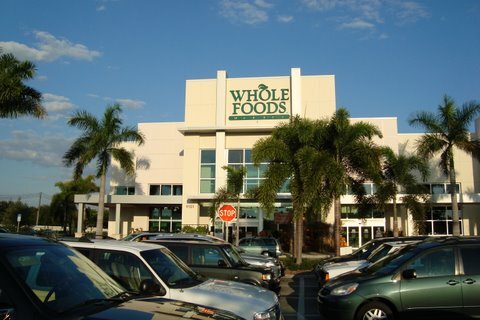 Having lived all over the state, I've been lucky to be near Whole Foods in Winter Park, Fort Lauderdale, Boca Raton, Pinecrest, Coral Gables and Naples. The Whole Foods Market in Naples is the one I'm most familiar with, and it's one of the best I've seen. I had lunch there almost every day when I lived in Naples. It's a social event as well as a delicious nutritious meal. Whole Foods has several huge hot soup, salad and entree bars that have just about anything you could want for $7.99/pound. I have mastered the art of building a great lunch for usually less than $ 9.00, tax included. One end of the Whole Foods Market in Naples is a sit down area where you can take your food and eat at one of dozens of tables or counter benches. One of my typical lunches might include delicious blackened Mahi Mahi, a large salad with cabbage, broccoli, tomatoes, spinach and any number of other fresh organic vegetables. I do drink tap water instead of the more exotic bottled waters available, and I suspect it is filtered somewhere in the building before bubbling up in the water fountains. 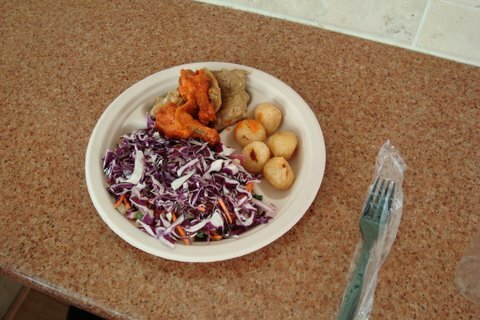 The ethnic delights are constantly changing from day to day. On any give day you might have Chicken Korma (Indian), Chicken Cacciatore (Italian), Country Fried Chicken (North Florida), Greek Salad (Greece), Tacos con Carne (Mexico), Yucca con Queso (somewhere south of the border), Chili Glazed Thai Chicken (Thailand), Arroz con Pollo (ditto), Picadillo (Cuba) and any number of other great dishes from around the world. They also have great desserts, including something affectionately named "The Vegan Chocolate Chip Cookie" because it has nothing of animal origin in it. No butter, no fat, no cream, no whatever...... and it is still delicious. Hmmmmm ......... maybe these Vegans are on to something after all. Service at Whole Foods Market is excellent. If something is running out on the buffet, just ask. A friendly employee will run into the kitchen and get it for you. The checkout people are always smiling and friendly and act as if they love their jobs. I am high on Whole Foods, but still do most of my grocery shopping at Publix just out of old habits and loyalty to a good old Florida firm. Grocery prices at Whole Foods are competitive in price with Publix, but I hate to spend all of my money in one place. I do, however, buy my walnuts and bison burgers at Whole Foods. Naples Fla is in the far southwestern corner of the state at the intersection of US-41 and SR-84. These were once the main north-south and east-west routes, but have now been supplemented and replaced to some degree by I-75.